As a company that bases it's business on the provision of gourmet hampers that showcase quality local produce and producers, D'licious Gourmet Hampers are delighted to be selected by the Qld Premier's Department as their preferred provider of gift hampers for visiting international dignitaries. There is a growing demand world wide for quality regional food which typifies the region it originates from. As proud Queenslanders, we are fortunate to be blessed with a wealth of quality produce and talented producers. Flavours such as ginger, mango, pineapple, macadamias, avocados, passionfruit, to name a few, have become synonymous with Queensland. 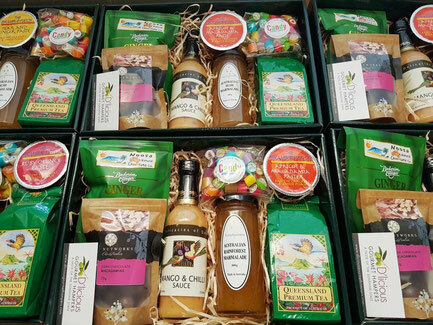 Our hampers provide a sampling tasting of these flavours, in quality products that are both delicious and useful. They are indeed the perfect gift for a visitor to our state, and, one which they can continue to savour when they return home and fondly remember their time spent in the paradise we call home.